The Game of Thrones season seven moment when Arya and Sansa finally take down Littlefinger is triumphant. It proved that the Stark sisters understand that they're at their strongest together, while also illustrating how adept they've become at carrying out a deception when necessary. Lord Baelish never saw them coming, and in season eight, there's a chance that Cersei won't either. Since the season seven finale, there's been speculation from fans about whether Arya took Littlefinger's face after his execution. On the surface, it doesn't seem like his visage would be useful in her bag of tricks. 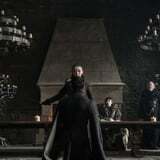 After all, Sansa passes his sentence in front of an audience in the North, everyone at Winterfell that day, including the Knights of the Vale, know that he's dead. But there's one key player who may have no idea that the Stark sisters disposed of Littlefinger, and that person is Cersei. She's currently busy shoring up her army in the South and focusing on stopping Daenerys's bid for the Iron Throne. When it comes to the North, she knows the White Walkers are heading toward Winterfell, but she seems wholly unconcerned. In fact, she's counting on the army of the dead to decrease the number of enemies gunning for her seat in King's Landing. Would anyone who witnessed the death of Littlefinger send Queen Cersei a message? It seems unlikely. Arya Stark Is Running Away in the New Game of Thrones Trailer - but From Whom? The last time Cersei and Littlefinger talked was back in season five. During their conversation, he promises her Sansa's head. Cersei knows from experience that Lord Baelish allies himself with whichever side will get him want he wants. She's not happy about his false promises, but given her current political position, she might be willing to entertain an audience with an enemy she knows if she believes it would be benefit her. Enter Arya wearing Littlefinger's face. Remember, Cersei is on Arya's list, and she's someone that Sansa would no doubt like to see taken down for the role she played in their family's destruction. In a recent interview with The Wrap, Sophie Turner hinted that a showdown between the eldest Stark sister and the current Queen of Westeros could be in the cards for season eight. "It's definitely something that you could possibly see. And I would love to see Sansa have a face-off with Cersei," the actor said. "I think it would be a long time coming." And there's no better way to get Sansa, Arya, and Cersei in the same room than by Littlefinger appearing to finally keep his promise by giving Sansa to Cersei to do with as she will. It could even be considered an act of good faith to get back in her graces. Then all Arya would need to do is remove the stolen face and serve up some justice on behalf of the North. However, if season eight reveals early on that Cersei is fully aware of Littlefinger's fate, then this theory is unlikely to come true. Since all of the other major players know that Lord Baelish is dead, there's no political need for Arya to take his face. The Stark sisters are too savvy to use the face of a man the entire North knows is no longer among the living to trick Cersei if they even suspect the news made its way South. Still, as long as Cersei is in the dark, the possibility of Arya donning Littlefinger's face remains on the table for the final season.